“Pictou” by Phil Holmes. Licensed under CC Attribution-Share Alike 2.5. The history of the mill at Abercrombie dates to 1965, when the government of Nova Scotia signed an agreement with Scott Maritimes Pulp Limited to begin production in Pictou County by 1967. During the 1960s, the forestry industry in Nova Scotia was organized around three large firms: Scott Paper in Pictou County (later Northern Pulp), Stora Forest Industries in Cape Breton, and the Bowater Mersey mill in Queen’s County. Concerns over the impact of the forestry industry on the environment in Nova Scotia have been present from the opening of the Scott Paper mill. 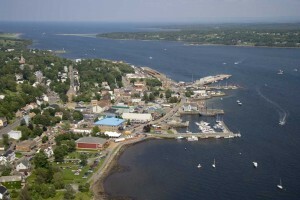 As early as 1969, community members and residents of the Pictou Landing First Nation had lobbied government for a solution to the Boat Harbour pollution. Despite several promises to the band and other citizens, the provincial government failed to clean up the site through the 1990s and early 2000s. American pop culture icon and activist Erin Brockovitch got involved with the Northern Pulp issue on 2 September when she commented through social media that “it is virtually impossible to breathe clean air in Pictou,” and that the mill is “destroying the community’s quality of life significantly.” In a stern warning, reminiscent of a 2006 exchange between Paul McCartney and then Newfoundland Premier Danny Williams, Brockovitch noted: “I feel like I’m talking to one of my kids: pick up your mess.” On 27 August, a letter to the editor of the Chronicle Herald newspaper from Jane Sproull Thompson of Trenton called for the provincial government to “wake up and begin planning for something better than dirty, dangerous industrial jobs for (mainly) men with, at best, a high school education.”  In a province struggling with economic issues relating to deindustrialization and with a new union contract that outlines major concessions, is it no wonder that Northern Pulp employees express scepticism towards an environmental movement that gives voice to American quasi-celebrities and others who portray industrial workers as childlike, out-dated and uneducated. L. Anders Sandberg and Peter Clancy, Against the Grain: Foresters and Politics in Nova Scotia (Vancouver: UBC Press, 2000). Thomas Dunk, “Talking about the trees: environment and society in forest workers’ culture,” Canadian Review of Sociology/Revue canadienne de sociologie 31, 1 (1994), 14-34. Although the “Clean Pictou Air” activist group has stated that they are not seeking the closure of the mill, the mill has stated that any extended closure resulting from the environmental issue will likely not see the mill re-opened. The mill’s manager Terri Fraser wrote to the newspaper following the publication of Sproull Thomson’s letter to clarify that 21 per cent of the mill’s employees hold university degrees, 57 per cent are journeymen tradespeople, seven per cent hold a post-secondary diploma, 15 per cent entered the workforce following high school, and none have less than a high school education. Andrew Hurley, Environmental Inequalities: Class, Race, and Industrial Pollution in Gary, Indiana (Chapel Hill: UNC, 1995). Dunk, “Talking about the trees,” 30. Wow, as one of those worker guys, it’s nice to see the story from a little higher altitude.